No, you did read the title correctly. 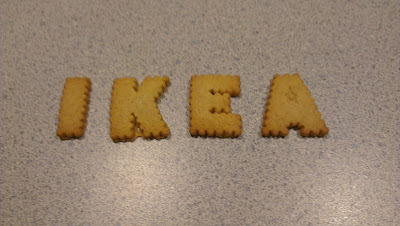 IKEA makes cookies and today I'm reviewing them. If you're thinking I'm hungry, you're correct. If you're also thinking that I'm not as motivated as I normally am, you're also correct. We're preparing for the visit of Little Man's Grandma and Grandpa in addition to having a full schedule this week, so my mind isn't totally focused. I'll also put in notice that we'll be posting infrequently while we have our visitors and that IKEA Vrijdag will also take a vakantie (vacation) during this time. IKEA produces various food tasties that are available for purchase. Usually, you schlep all your new, heavy purchases through the checkout line and the "pantry" is right in front of you, convincing you that you should probably spend a little more money. Generally, I find their food inexpensive in comparison to grocery stores (in the States and in the Netherlands); and, despite revelations of some ingredient "inconsistencies" earlier this year, the food is pretty good for being cheap and processed. The Kex biscuits/cookies are also cheap and tasty. They're similar to Nilla Wafers in flavor and size, though not in shape. IKEA "cleverly" uses this subliminal messaging in their shapes to have you continue to think about where you got the product. We give the Kex Biscuit/Cookie a rating of 4 Swedish meatballs on our 5 meatball scale. They're pretty good as far as store-bought cookies, but they're only store-bought cookies. "Spreekt u Engels?" "Yes, a little."